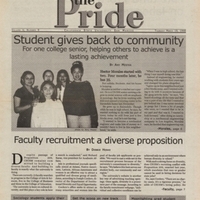 This issue of the Pride (Vol. 17, No. 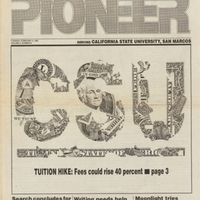 9) announces a new student fee hike, the new Masters in History degree for fall, the blood drive, student support of the faculty strike, and continued events for Women's Herstory Month. 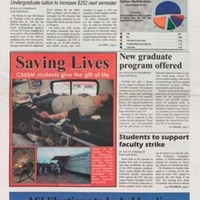 The faculty vote for a strike leads the news in Vol. 17, No. 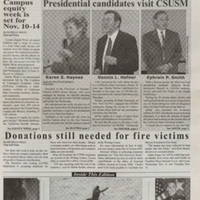 8 alongside the ASI election forum. Women prisoners lecture as part of Women's Herstory Month and the Pride looks at the Daniels Communication Lab. Vol. 17. No. 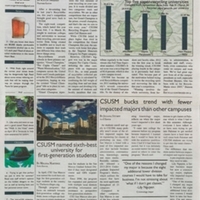 6 covers a rock festival, upcoming faculty vote on a strike decision, the dedication of the Tukwut Courtyard, the first Alumni Gala, and the impending closure of the Social and Behavorial Research Institute (SBRI). 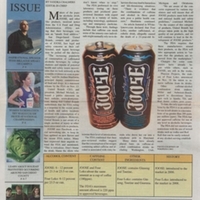 This week's issue (Vol. 17, No. 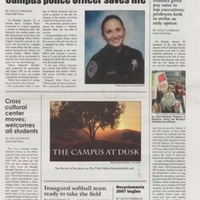 2) reports on a student saved campus police officer's quick actions, the move of the Cross-Cultural Center, faculty wage protests, the new softball team, and the start of a new Recylemania competition. Vol. 17,, No. 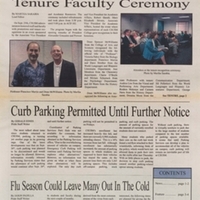 1 covers faculty wage protest, the establishment of a new fraternity (Zeta Beta Tau), the opening of Cougar Central for student services, and training on restraining orders from University Police. Vol. 16, No. 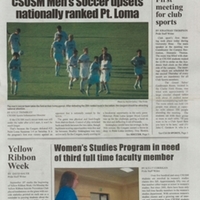 5 covers club sports, soccer win, Yellow Ribbon Week, the need for more faculty in Women's Studies, and international and exchange students. Vol. 14, No. 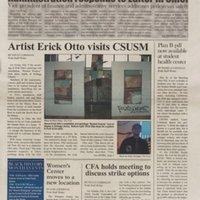 6 reports on a faculty tenure grievance, recycling success, Oktoberfest celebration, Proposition 73, Amnesty International, upcoming Career Fair, suicide prevention efforts, and the Writing Center. Vol. 8, No. 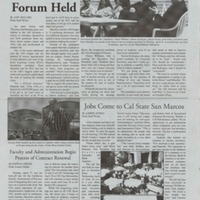 27 reports on the ASI candidate forum, job fair, faculty contract negotiations, library building groundbreaking, local protests regarding the Free Trade of the Americas Agreement, and a beach clean up led by the Environmental Club. Vol. 8, No. 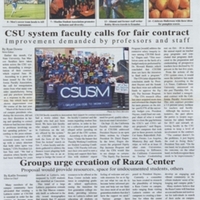 5 includes stories on faculty workload grievance, student algae discovery in local lagoon, infrastructure growth, the Barahona Center, student life, lack of athletic facilities, and on campus vendors. 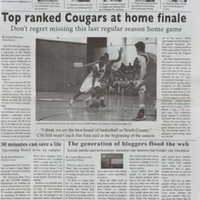 Volume 42, number 11 of The Cougar Chronicle. 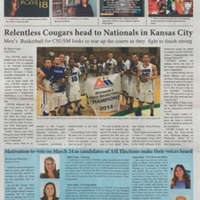 This issue includes stories of CSUSM men's basketball team championship and ASI elections. 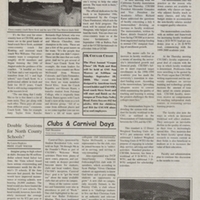 Volume 42, number 9 of The Cougar Chronicle. 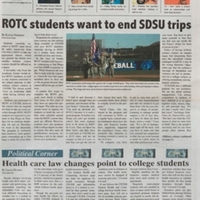 The issue includes stories of ROTC students petitioning for military science courses on campus, the Affordable Care Act, and sports. 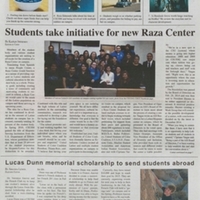 Volume 42, number 8 of The Cougar Chronicle. 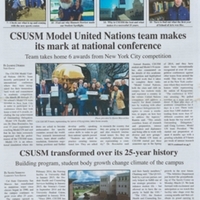 The issue includes stories of the CSUSM men's basketball team ranking number 1 nationally in the NAIA and environmental concerns. Vol. 7, No. 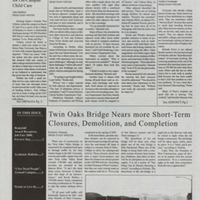 25 features adjunct faculty grievances, Twin Oaks Valley bridge widening, and the campus Greek system. 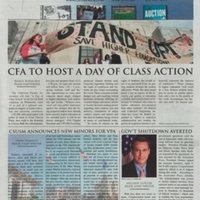 Increased faculty workloads and the CFA response are a subject of a cover story on the Vol. 7, No. 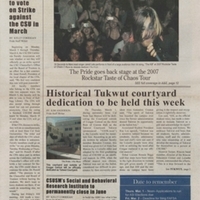 3 issue of The Pride. Vol. 6, No. 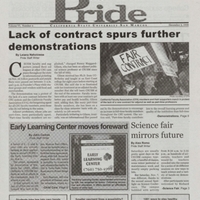 4 reports on faculty salary contract negotiations, the Early Learning Center, accessbility issues and science fair. Faculty recruitment and "giving back" are the subject of the Vol. 5, No. 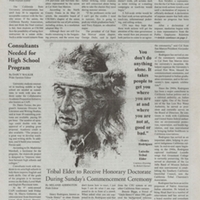 9 issue cover stories of The Pride. 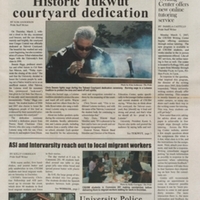 Volume 43, number 11 of The Cougar Chronicle. 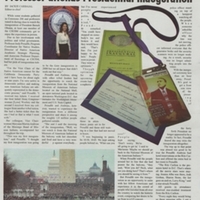 The issue is a Herstory, Women's History Month edition. 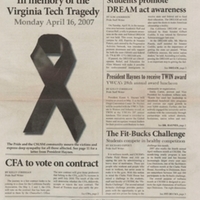 Other topics include faculty salary inequities, the Student Access Initiative, and President Haynes' award for female leadership. 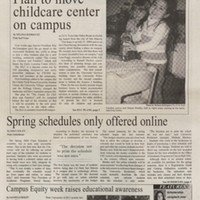 Volume 43, number 5 of The Cougar Chronicle. 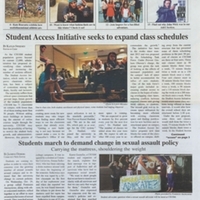 The issue includes stories of adopting a student access initiative in light of increased student enrollment and a student march demanding a change in the campus sexual assault policy. 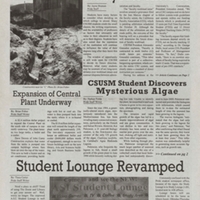 Volume 43, number 2 of The Cougar Chronicle. 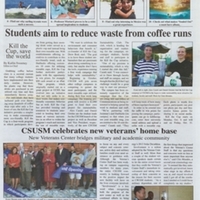 The issue includes stories of a sustainability campaign with the campus Starbucks and the ribbon cutting for the new Veteran's Center. 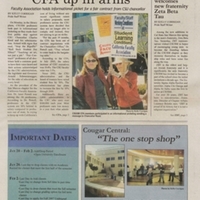 Volume 41, number 7 of The Cougar Chronicle. 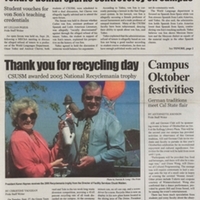 The issue includes stories of CSUSM winning the 2013 RecycleMania, CSUSM named the sixth-best university for first-generation students, and CSU faculty and staff pay raises. 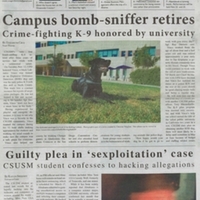 Volume 2, Number 8 of the first student newspaper on the CSUSM campus. 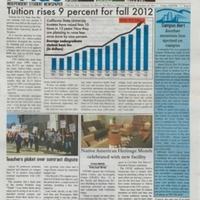 The cover story reports on tuition increase, campus construction, and new faculty appointment. 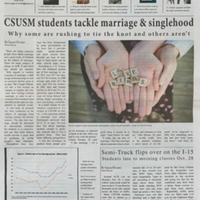 Volume 1, Number 11 of the first independent student newspaper on the CSUSM campus. 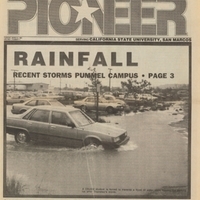 The cover story is about the recent storms that have rained down on campus. 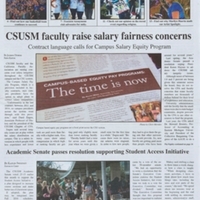 Inside the paper is a story about the recent activity to hire faculty campus-wide.